Of all the places in the world, in Gainesville, FL there exists a life-changing personal growth seminar that for 15+ years has been transforming the lives of thousands of people - people who have cared about themselves enough to courageously explore what's been blocking them so they can get to the liberating truth of who they truly are. Satvatove is a non-profit organization whose mission is to facilitate personal and group transformation through empowered communication, courageous introspection and purposeful action. Really, Satvatove is two people - Dr. David B. Wolf, Ph.D. and Marie Glasheen - two masterful coaches who are totally devoted to your true self-awareness. Their expert coaching skills and seminar processes, combined with their rare grounded ways of being hold the container through which life-changing transformation happens in the hearts of courageous people year after year. Their seminar is for anyone who knows that you are being somehow held back by your fears, and you are finally willing to step out of the vicious cycles of self-sabotage that have been inhibiting you so you can experience the fulfillment of your true self living in your true potential. to offer the world. Living from this new lens, my whole life changed. My relationships got healthier, my inner talk grew more loving, my self-image got stronger. Over the next few years I healed my relationship with my father, which supported him to stay sober for 2 years, the longest period of his life, before he died in March 2018. I am so grateful to myself that I made the decision that day invest in my healing because it allowed me to be emotionally available to my father in his last months, and receive the love he always had for me even though it didn't always look the way I wanted it to. Through the work that I did in the seminars, I also discovered my life purpose. I have now been successfully self-employed as a transformative coach for 2 years. I discovered that my dreams were only possible if I believed I was worth living them. I still struggle with similar issues at times - insecurity, expectations of myself and others, feeling not good enough - though these cycles that used to keep me down for weeks or months I now manage with more grace and trust in a matter of hours or days. Today many people see me with deep appreciation for the light I helped bring to their lives through my loving and supportive presence, which only was made possible because I decided one day that I was worth investing in my own healing. I invite you to begin sending yourself the message that you are worth investing in your own healing, too. Throughout my life I have carried the deep belief that if people would really see me, they wouldn't love me. My father was an alcoholic, and his emotional neglect left a deep wound. As many hurtful childhood experiences do, this unresolved pain manifested in adulthood as self-defeating behaviors that were holding me back from the woman I wanted to be: co-dependent relationships, deep insecurity, a harsh inner critic, and not believing in myself. On a search for freedom, in 2013 I left to hike the Appalachian Trail. I was disappointed to discover that freedom could not be chased as all of my issues followed me. I returned back home still wondering what freedom meant. Alive in that yearning, one night soon after I coincidentally ran into a friend who had a rare magnetic quality. After some conversation I discovered that he had just graduated from the Satvatove personal transformation seminars. Intuitively I felt a strong "yes" inside that this was for me. Hesitant to sign up because of the financial investment, but knowing nothing else besides my strong intuition and an urgency to feel free, I took a trustful risk and participated in Satvatove's seminars in 2014. “This course has expanded my ability to express myself and truly helped me uncover why I am so valuable. I can listen with full intention of hearing in a place that suspends judgements and allows people to be comfortable … I have and continue to make many realizations in my life that are continually helping me connect with who I truly am.” - Jessica T.
The focus of the Foundational Course is skill development - relationship skills with yourself and with others that can radically transform your experience of your life. This course is about 20% didactic style education, with about 80% experiential style learning. The goal of the facilitators is that you connect with your highest guidance within you, based on the philosophy that you are the expert in your life and not them. 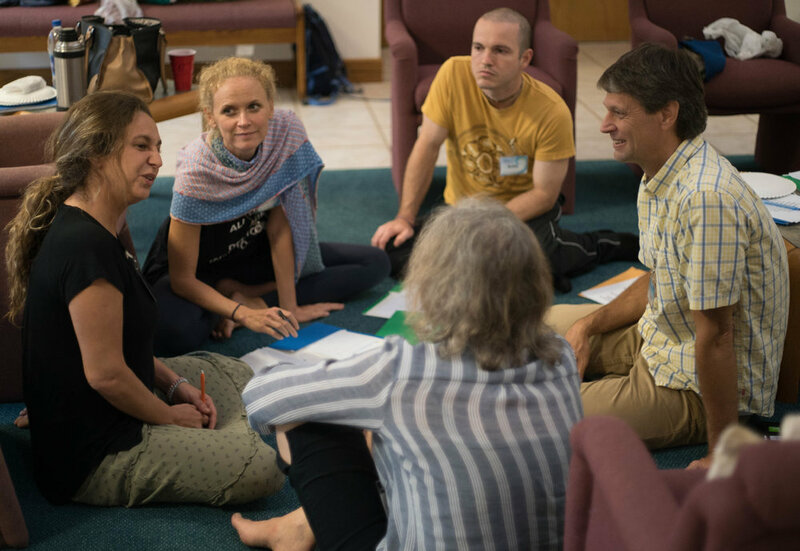 From that philosophy you will participate in many experiential-learning-based hands-on processes in groups of 2, 3 or more, to help you connect with your own personal realizations and wisdom. Pull the weeds from your heart that are covering your experience of your true self, and clouding others' experience of who you are, so that you can be in your integrity in your work and relationships and feel the self-confidence and deep inner security that comes with that. Feel truly cradled by a new family of people who truly see you. Experience some of the deepest levels of love and belonging that you may have ever experienced, so that you can live from the liberating remembrance that you are in fact worthy of love. Free yourself by expanding beyond your threshold with levels of courage that you likely haven't accessed before, so that you can re-define what's been possible for you till now and open yourself up to life-affirming opportunities. Satvatove 3 encompasses the spiritual roots of Satvatove, and is often referred to as the "cherry on top" of all the programs. While the Advanced Course is mostly about pulling the weeds, Sat 3 is more about watering the garden, and the experience, in general, is more light. Satvatove 3 is about mastering being a spiritual being having a human experience, so we take the communication and personal growth skills and principles we learned in the Foundational and Advanced, and we apply them experientially in more depth in Satvatove 3 in a way that increases our experiencing ourselves as a distinct spirit soul having the variety of human experiences. One element of that is learning how to be the experiencer of our experience, rather than losing ourselves in our experience (ie. experiencing our fear rather than misidentifying with the fear). Another is learning how to communicate our experience in a way so that others really get us. For me a lot of the course was about acceptance - learning how to stop resisting the reality of where I'm at within myself, where others are at, and where the world is at, and practicing moving towards deeper acceptance of my human context, dropping the attachments to expectations I've had of myself and others that have been limiting my potential, which makes me more free and available to make healthy progress in life and relationships, and to give fully to my purpose in my life. And life purpose is really the essence of Satvatove 3. Moving towards a deeper level of personal and spiritual responsibility in my life, so that I can give fully to my purpose, and be a source of spiritual sanctuary for myself and for others in my life and in my service. Dr. David Wolf has been teaching transformative communication for more than thirty years. He has been featured as a communication expert on numerous media sources, including Fox News and CNN News. David developed the spiritually-based transformational programs of Satvatove Institute, which have become an emerging presence in the world of personal development. He has decades of experience in social and mental health services, including counselor training, children and family counseling, and medical social work. In 1998 he established the international child protection organization, The Association for the Protection of Children, and served as its Director for more than six years. David created the Vedic Personality Inventory, a personality assessment tool based on guna psychology, and has been widely published in top social science journals in fields such as child protection, speciesism, and the effects of meditation on mental health and life satisfaction. His doctoral dissertation included research on the effects of chanting ancient mantras on alleviating stress and depression, and increasing life satisfaction. Also, David is the founder of the Satvatove Institute School of Transformative Coaching, and is a Master Certified Coach (MCC) with the International Coach Federation (ICF). Dr. Wolf has practiced bhakti-yoga since the early 1980s. He is the author of Relationships That Work: The Power of Conscious Living, How Transformative Communication Can Change Your Life. Marie-Hélène worked with David in developing the seminars. Her special contribution is based on her 25 years of studying human nature and psychology. Marie-Hélène also brings her qualities of warmth, understanding, and non-judgmentalism. She is an intuitive healer and assists people in realizing the emotional, psychological, and physical reason for their lack of vitality and enthusiasm. Years of counseling and life experiences blended with her intuitive nature guide clients to the heart of the matter. This enables them to come from a point of clarity about real issues and to be motivated to make needed changes for the life they desire. Marie-Hélène specializes in the mastery of awareness of limiting belief systems, which also encompasses the subconscious beliefs that sabotage you. The programs she works with have created positive, profound and permanent life changes for the participants. "The Satvatove Experience is the highest level of authenticity, connection, self-fulfillment, and loving acceptance that I've ever experienced... This is what being a human being is really about." Date: Satvatove 3 happens once every two years. The next one will likely be sometime in 2020. Course hours: Begins at 11:30am on the first day. Ends the evening of the fourth day. Food: Not provided. Bring your own snacks and lunch, or go out and purchase lunch during lunchtime. Breaks will be scheduled throughout the day including one large meal break. Includes a free copy of the new edition of Relationships That Work by David Wolf and a 1-hour personal coaching interview. Course hours: Begins at 9AM on the first day. Ending/starting times vary by day. Includes course material and a 1-hour post-seminar personal coaching interview. The Satvatove Personal Transformation Experience is an opportunity for you to send yourself the message that you are worth your own time, love and energy. Participating in the seminar is an opportunity for you to make your freedom, your healing, and your ideal life and relationship experience a priority. Many claim this seminar to be the best investment of their lives. 3-month and 6-month payment plans available. Satvatove is so confident in the value of this course that they offer 100% guaranteed satisfaction or your money back. If you are at this point on this webpage, you might be interested or at least curious in this experience. I invite you to trust whatever calling you feel. If you are interested, schedule a chat with me on the phone. You can ask your questions without any expectations from me to sign up, and learn more about the course from someone who has re-taken it many times.